Between January and December 2018, a total of 144,166 migrants and refugees arrived in Europe using different land and sea routes. Estimated 28 per cent of the overall arrivals in 2018 were recorded in the last quarter of the year (40,716). This represents 10 per cent decrease compared to 45,092 registered in the previous quarter and a slight (5%) increase compared to 38,463 reported in the same period in 2017. 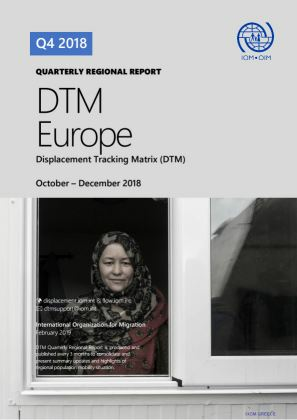 Authorities in Bosnia and Herzegovina, Albania and Montenegro registered 9,749 new persons in the last quarter of the year, eight times more than 1,204 reported in the same period in 2017.